A Study in Scarlet is a detective mystery novel written by Sir Arthur Conan Doyle, introducing his new characters, "consulting detective" Sherlock Holmes and his friend and chronicler, Dr. John Watson, who later became two of the most famous characters in literature. Conan Doyle wrote the story in 1886, and it was published the following year. 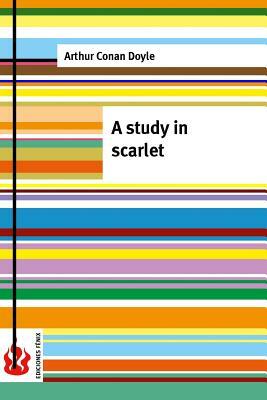 The book's title derives from a speech given by Holmes to Doctor Watson on the nature of his work, in which he describes the story's murder investigation as his "study in scarlet" "There's the scarlet thread of murder running through the colourless skein of life, and our duty is to unravel it, and isolate it, and expose every inch of it.